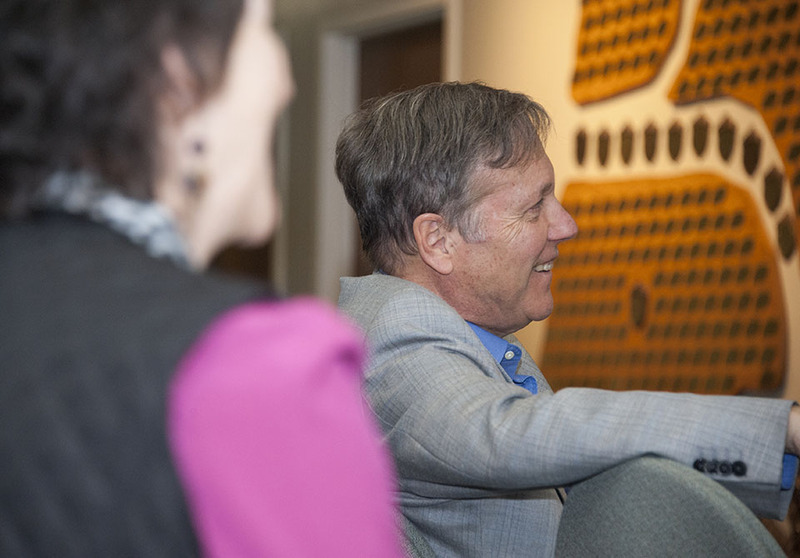 California Poet Laureate Dana Gioia captivates his audience Nov. 16, 2017, in his first-ever reading at California State University, Northridge. Photo by Sarah Dutton. 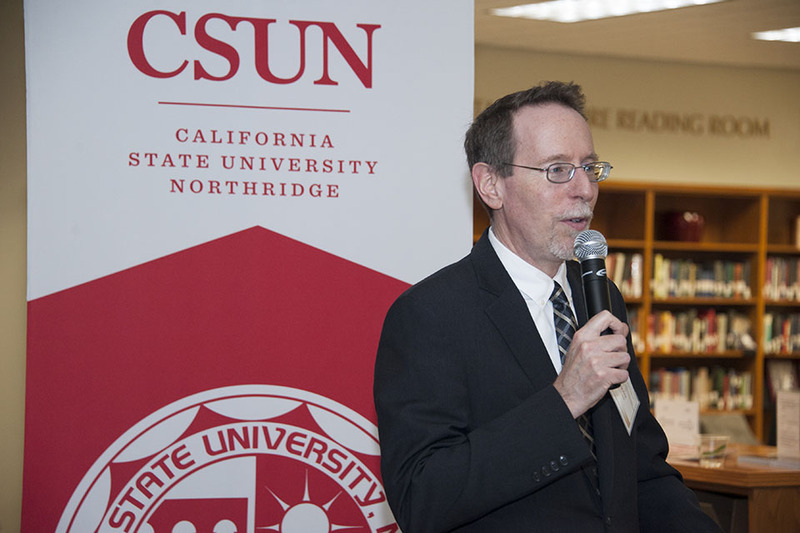 Mark Stover, dean of the Delmar T. Oviatt Library, introduces California Poet Laureate Dana Gioia at the poet's first-ever reading at California State University, Northridge, Nov. 16, 2017. Photo by Sarah Dutton. CSUN geography professor emeritus Robert (Bob) Gohstand introduces California Poet Laureate Dana Gioia, who gave his first-ever reading at the university on Nov. 16, 2017. The free evening lecture and reading took place in the Robert and Maureen Gohstand Leisure Reading Room in CSUN’s Delmar T. Oviatt Library, which the couple dedicated in 2014. Photo by Sarah Dutton. California Poet Laureate Dana Gioia listens to introductions, before his first-ever reading at California State University, Northridge, Nov. 16, 2017. Photo by Sarah Dutton. 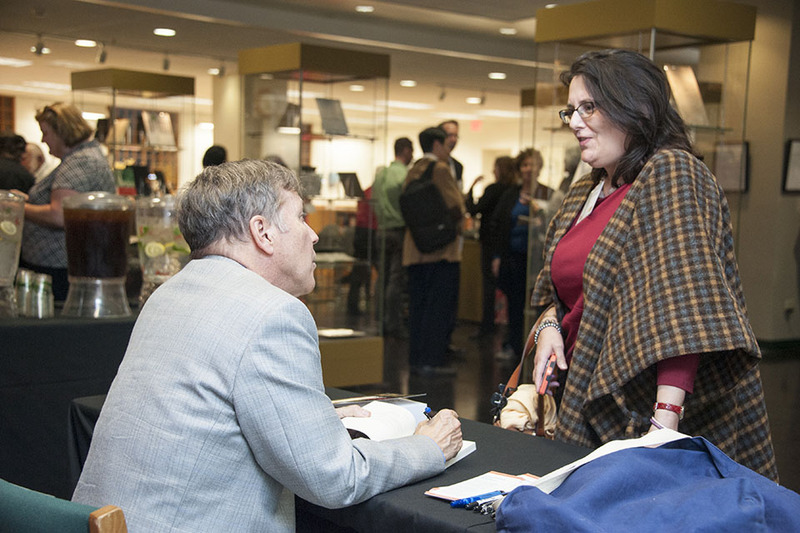 California Poet Laureate Dana Gioia chats with and signs one of his books for CSUN graduate assistant Linda Russano, after Gioia gave his first-ever reading at the university, Nov. 16, 2017 at the Delmar T. Oviatt Library. Photo by Sarah Dutton. The words leapt right off the page and hung in the air, heavy, encircling the audience. Their creator stood, offering his gifts of verse — shared in a powerful baritone voice. 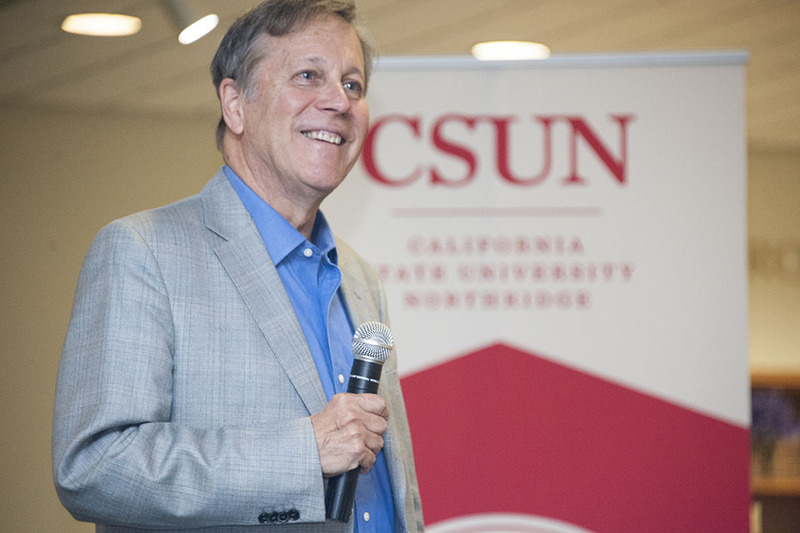 California Poet Laureate and native Angeleno Dana Gioia captivated his audience Nov. 16 in his first-ever reading at California State University, Northridge. 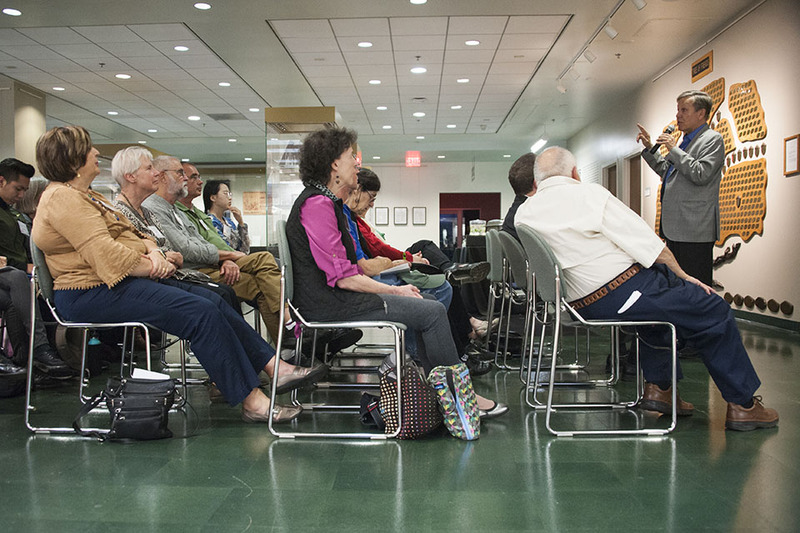 Gioia, one of the country’s greatest living poets and former chairman of the National Endowment for the Arts (NEA), drew more than 100 fans — including faculty, staff, alumni, students and patrons — to the Robert and Maureen Gohstand Leisure Reading Room in CSUN’s Delmar T. Oviatt Library. The free evening lecture and reading, called “The Joys of Poetry and Prose,” was the inaugural event in a biennial speaker series for the reading room. 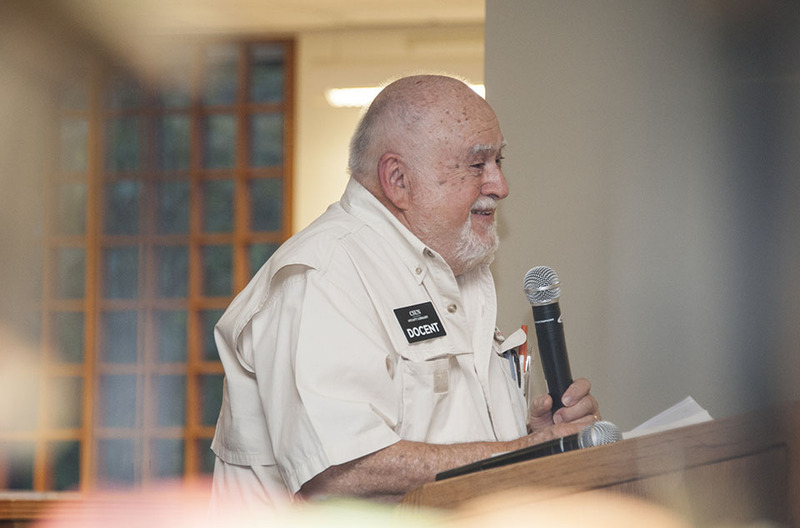 Before reading from his own works and taking questions from the audience, Gioia spoke about the decline of reading in American society and his quest — personal, academic and as head of the NEA — to reverse that trend. “The early experience of reading opens up something in an individual’s mind and imagination, which makes him or her begin to lead their lives differently,” Gioia said. “Children, from the very earliest age, need to read stories. They need to know how many possible outcomes any story has, how many characters, how many plot reversals. If you don’t train the imagination early on, it tends to be locked into a very narrow set of possibilities. “It’s the books that capture the imagination that deliver the practical outcomes, rather than the books that are designed with cold-blooded pragmatism to teach people mechanical skills of reading,” said Gioia, who also serves as the Judge Widney Professor of Poetry and Public Culture at the University of Southern California. 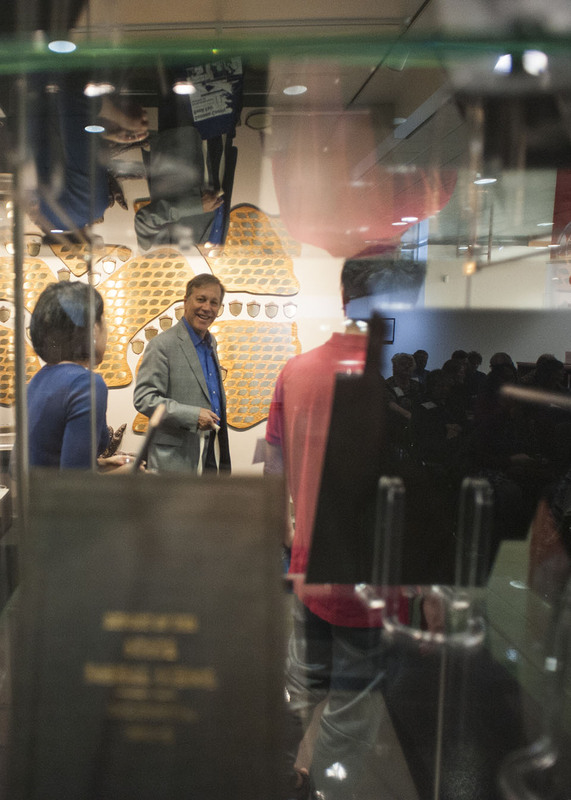 Like many CSUN students, Gioia was raised by immigrants and was the first person in his family to attend college, noted Mark Stover, dean of the Oviatt Library. Gioia grew up in the low-income LA neighborhood of Hawthorne, just blocks from the public library. Gioia spent the first 15 years of his career writing at night while working for General Foods Corporation. After his 1991 essay “Can Poetry Matter?” in The Atlantic generated international attention, Gioia quit his day job to pursue writing full time. “Can Poetry Matter?” was a finalist for the National Book Critics Circle Award and is credited with helping to revive the role of poetry in American public culture. He served as NEA chairman from 2003-09. He has published five full-length collections of poetry and won the Aiken Taylor Award for Modern American Poetry for lifetime achievement in American poetry in 2014. In addition to the poetry collections, he has published three volumes of literary criticism, as well as opera libretti, song cycles, translations and more than two dozen literary anthologies. Gioia was appointed California Poet Laureate by Gov. Jerry Brown in 2015. In this role, he advocates for poetry and literature in libraries, classrooms and in communities across the state. As his official project, Gioia set out to become the first state poet laureate to hold poetry readings in all 58 counties in California. “I’m trying to go to Lassen County, but Lassen doesn’t have any libraries,” he quipped. “There are 3,000 people [in the county], and the person who runs the arts for the state there, it’s a part-time job. She also works as a forest ranger. In a lot of these places, I’m the first person who’s ever given a poetry reading. 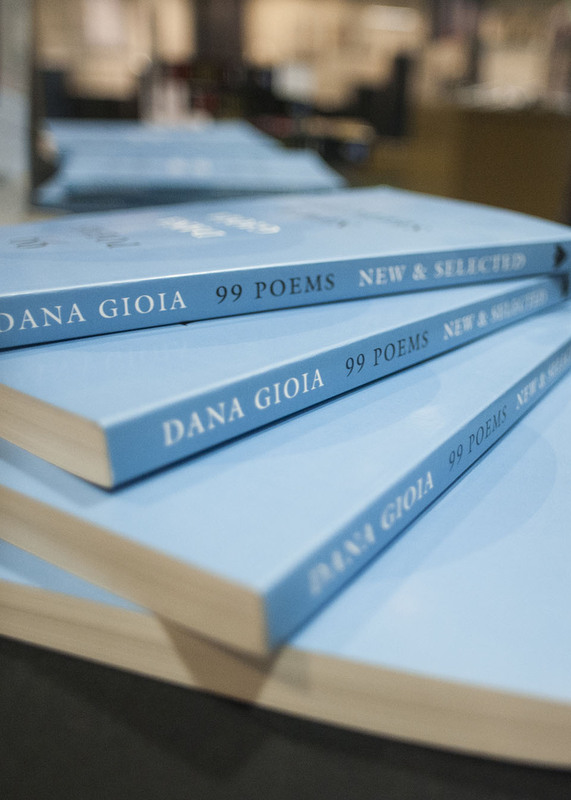 The fans and scholars who attended the CSUN event with Gioia represented both camps — readers and listeners — and they sat in rapt silence after the poet switched from his “sociological mode into my squishy, poetic one,” he said, grinning. He recited several of his poems, most of them about California. These included “The Apple Orchard,” an ode to a springtime stroll in a Northern California orchard with a girl he’d loved in college, and “Pity the Beautiful,” about the “cult of beauty in LA.” He also shared “Majority,” a wistful poem about the son he and his wife lost at 4 months old to Sudden Infant Death Syndrome. CSUN student Crystal Gordon, a child and adolescent development major who is studying to become an elementary school teacher, asked Gioia’s advice for fostering students’ comfort in writing poetry. He advised Gordon to help children connect with language by memorizing short poems and sharing poetry they love, such as funny poems about animals. As an example, he recited an Ogden Nash poem about a panther. He also shared his influences with the audience, including his favorite poets: Shakespeare, John Donne — “especially when he’s smutty” — Tennyson, Robert Frost and Philip Larkin. Securing a dedicated space for leisure reading at the Oviatt Library was a longtime dream of geography professor emeritus Robert (Bob) Gohstand. In 2014, Gohstand and his wife, Maureen, dedicated the leisure reading room, which is located on the second floor of the library’s west wing.